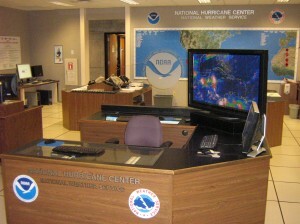 The Hurricane Network carries on the strong record of close collaboration between WeatherFlow and the various agencies of the National Oceanic and Atmospheric Administration (NOAA), including the National Weather Service (NWS), National Hurricane Center (NHC), and National Ocean Service (NOS). Data from WeatherFlow’s entire network has been of tremendous assistance to multiple Weather Forecast Offices (WFOs), NWS regions, and the NHC over the years, including Hurricane Isabel, where WeatherFlow’s sensors filled critical data gaps in this major East Coast storm. In accordance with signed agreements, data from the Hurricane Network is provided to the NHC for its use in issuing Hurricane watches and warnings, monitoring of life- and property-threatening conditions, and research into the structure of landfalling hurricanes. Data from the network is available in the AWIPS system, allowing NHC and NWS forecasters to closely integrate Hurricane Network data into their real time forecasting and warning operations.